The possibility of joining the Mediterranean Sea to the Red Sea had occupied the minds of brilliant men for hundreds of years. The Egyptians, Darius, King of Persia, the Venetians, and Napoleon all made plans that came to nothing through lack of materials and engineering knowledge. 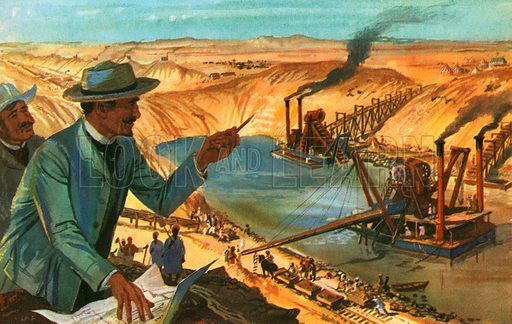 The canal was planned by the French diplomatist, Ferdinand de Lesseps, and constructed between 1859 and 1869. It is called Suez canal. It is just over 100 miles long and saves 1,000 miles on the journey from Europe to Australia. Available worldwide for immediate download up to 5,028 x 3,182 pixels.